With more than 2,300 craft breweries and counting open in the US, it’s becoming difficult to remember a time when craft beer wasn’t everywhere. That time wasn’t as long ago as you might think. Forty years ago in fact, a retired Navy veteran named Jack McAuliffe quietly started the American craft beer revolution as we know it. Trying to replicate the beers he drank during tours of Scotland and other parts of Europe, McAuliffe first brewed his pale ale in 1976. Since small-batch brewing equipment was not available at the time, he made his own. He named the beer “New Albion” ale as a reference to Sir Francis Drake, who named the land in what is now northern California “Nova Albion” back in the 1500s. McAuliffe was forced to stop his brewing operation in 1982 when he couldn’t secure financing (to give you an idea of the timeline, Harpoon, the first production craft brewery in Mass., opened in 1987). 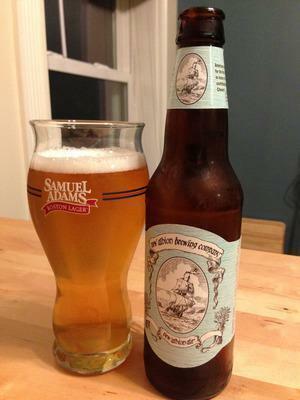 But with help from Boston Beer Company (Samuel Adams), New Albion has been brewed and released once again. With help from the pioneering brewer and using McAuliffe’s original recipe, yeast strain and all, Jim Koch and Samuel Adams recreated the beer right down to the label. On it, a ship called the Golden Hinde (a nod to Drake) departs the San Francisco Bay area. The beer is brewed exclusively with American Cascade hops, just like McAuliffe used. It weighs in at 6 percent alcohol by volume and a relatively mild 30 IBUs (international bitterness units). Enough with the history. Let’s take this little lady for a sail and see how she goes. Poured into a Samuel Adams pint glass, New Albion looks like a paler version of your usual pale ale. Strong carbonation is evident as rivers of tiny bubbles rise to the top. A wispy white head evaporates down to nothing in short order. The nose is mild, with faint pine, citrus, and cereal wafting up from the glass. Take a sip and subtle hops are the first thing to hit your lips. The flavor quickly goes from clean to buttery, and a lingering malt sweetness finishes the brew. If you’re looking for an in-your-face, lip-puckering pale ale, you won’t find it here. If you’re looking for a pale ale with the clean start and finish of say, a Czech pilsner, you won’t find that, either. As a piece of brewing history this one’s worth a shot, but fans of now-classics like Sam Adams Boston Lager or Harpoon IPA will find that both of those beers pack much more flavor. The Massachusetts Brewers Guild, a nonprofit organization that promotes the interests of craft brewers in the state, has announced a membership level for non-brewers. The guild currently has 45 brewing members, but the new membership level allows “any business or individual interested in supporting the Guild’s mission to promote craft brewing and protecting the interests of craft brewers in Massachusetts” to join. The first associate member is Belmont’s Craft Beer Cellar, a specialty beer shop that carries, at the time of this writing, 880 beers from 320 craft breweries, many of them local. Gary Dzen can be reached at Gdzen@boston.com. Follow him on Twitter @Globegarydzen.